LUCY BURDETTE: When the Malice Domestic Agatha nominations came out this year, a lot of folks noticed how many of the nominees had risen out of the Guppies organization--the Great Unpublished arm of Sisters in Crime. And we were reminded about the original steering committee for the Guppies--if you read the history on the Guppy website, you'll notice some very familiar names. KRISTA DAVIS: I cannot tell you how very proud I am of the Guppies. We faced some challenges in the beginning, but we worked together to overcome them. I still remember people saying the Guppies were "the blind leading the blind." If none of us had ever been published, how could we possibly help each other? Back in those days, we had an occasional live Guppy Chat. One day, I was in the chat room we used, testing it with another woman when someone named Kinsey logged in. OMG! Kinsey! The two of us did some frantic messaging. Could it be Sue Grafton? Would she call herself Kinsey? Why would she be there? It could be anyone. It could be some old man having a laugh. Suddenly, the other woman excused herself, saying she would be right back. Ack! I was alone in the chat room with someone who might, or might not, be Sue Grafton! Kinsey was very nice and asked me what I was reading. I decided I might as well take a chance and ask her advice. Maybe it wasn't Sue, but what did I have to lose? It wasn't as though I would ever have another chance to talk with Sue Grafton. So I told her about the Guppies and asked what advice she might have for us. Her response was very simple. "Hone your craft." She said that she saw too many people trying to write mysteries without understanding them. That we needed to work at improving our manuscripts and learn about the craft of mystery writing. Over the years, I think the Guppies have done exactly what Sue suggested. We swapped manuscripts and started critique groups (and let me tell you, I learned a ton from that!). We took classes and shared helpful information. We learned about agents and queries and the crazy publishing business. When we started, one of the most commonly asked questions was what font to use! Two years ago, Sue Grafton was an honoree at Malice. She happened to see me in the hallway of the hotel and struck up a conversation. I told her about asking her advice in the chat room. She was aghast. "Oh no! What did I say?" I was happy to assure her that she gave us great advice. I cannot believe that 14 years have passed. It's been quite a ride, full of ups and downs. But when I look at the list of nominees for the Agatha, I realize just how far we have come. Apparently, the blind can lead the blind pretty well! If you're not published yet, don't despair. The difference between a writer and an author really is perseverance. The Guppies are living proof of that. Congratulations on your well-deserved successes . . . .
One of the best parts about getting to know authors for me is to see how much they support one another, especially groups like Sisters in Crime and here on Jungle Red Writers. The Guppies sound like they are an indefatigable group of strong writers and women who writing themselves a destiny of success. As Yoda woulds say, "Inspiring it is." oops, "who are writing themselves"
I've never heard of the Guppies, but I really like the sounds of the group. And obviously you've had a lot of great success, so huge congrats! I love the Guppies. I will be thankful forever to the great unpublished writers who believed in themselves enough to get it going and stay with it... And all the published writers who stayed on or stopped by—like OMG Kinsey—with comments and advice. Go Gups! The Guppy chapter is phenomenal. They offer concrete help such as critique groups and classes, but they are also a daily source of enthusiasm and encouragement. So much of writing success is mental. The Guppies' bond to one another is strong--they truly are sisters (and misters). Waving hand! I'm one of those unpublished Guppies who now has two published series going on (not bestsellers yet, but we're working on that...). I never, ever would have gotten where I am without what I learned from the Guppies. It's the biggest best support group out there, too. The steering committee has been upping the online course offerings lately, too. More honing the craft. Thanks so much to Krista and Leslie Budewitz and the rest of the founders. The Guppies has always struck me as a very worth-while and caring organization. Anyone I have ever talked to who was a part of it just glowed with the feeling of support from fellow newbies and established suthors. I have been so happy to see so many of them on the nominee lists over the years. And this year proves that this trend will continue for a long time. It just goes to show you that everyone can help everyone else. We all have something to contribute and together great things can (and will) happen. Oh my goodness! The Guppies! The friendship, the enthusiasm, the knowledge , the support , the sheer love of writing--this group is amazing . I joined in 2007 as a trembling newbie -- and not a day goes by that I am not beholden and grateful ! What a life-changing group...each and every one of you touches my heart. What a great story, Krista. I've been a Gup for a dogs age, not quite from the start. Krista, thank you for telling the story of the Guppies. I joined two years ago and the experience has truly been incredible. Not only have I found allies, advisers, critique partners, and friends, but also I've learned so much about the publishing business. I truly credit the Guppies for helping me take that step from saying "I want to be" to "I am" a writer. Wow, I wish I'd known about the Guppies.... Sounds great! Always learn something new on this blog. The Guppies sound wonderful. Krista, It's fun to hear of the Guppies olden days -- and your stories of Sue Grafton are priceless. So much fun to read your reminiscences about the early days of the Guppies, Krista! I have so many friends who are/have been Guppies and who have found the organization absolutely the most helpful thing out there. Unfortunately, I'd not heard of Guppies until I was already a published author, so I missed out on all that. I'm certain it would have shortened my wandering-in-the-wilderness days. I'm teaching a couple of Guppies online craft classes this summer and so looking forward to it. Krista, many years ago,before I'd even heard of SinC and Guppies, you answered a writing question I posted on your website. I've never forgotten your generosity in sharing knowledge and support - a true Guppy. I might still be unpublished if it weren't for the Guppies. It's a terrific group and I recommend it to any mystery writer who wants support and helpful advice. Aww, Tiger, I'm sure a lot of authors would have been happy to help. I shouldn't be getting the praise here. There are so many Guppies who have given their time over the years. Leslie Budewitz, Denise Tiller, Gigi Vernon and Deborah Benoit were all part of the original steering committee. We worked together to get the Guppies going. It's a wonderful group. Just as KB said, many of us are now close friends. Where else would people understand the pain of rejections and discussions of murder methods? I am embarrassed to say that I "keep meaning to look into the Guppies." The moment is now. Oh, yay, Krista! I just love that story about you and Sue Grafton! It illustrates the spirit of the Guppies chapter beautifully, and of course, Krista embodies that spirit. 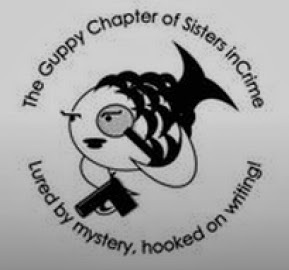 I started writing completely unaware that A) I was writing a mystery and B) that there was a Sisters in Crime, never mind Guppies. That was back in 1998. Had Guppies been invented? (Had the Internet been invented??) Because I sure could have used the help and moral support. Sigh. I LOVE the Guppies. Started out as one, and still am one. Even though I'm published, I'll never leave. These women, just like those in SinC, are amazing. You are right Krista and Leslie, the challenge now is really sorting through all the available information and making the smart choices. Back when I was starting to submit, you couldn't very easily submit too quickly. But now I think that's one of the big challenges--slow down and make sure your writing is ready! As a new writer, the whole act of writing a book (!) is daunting. When I joined the Guppies in 2009 I had the first draft of a book and nowhere to turn for help and advice. I found support, help, ms swaps, information on small presses, agents, writing synopses, query letters. And I'm now writing the final chapter in my ninth book. I can't thank all of them current and past...and I'm incredibly proud to the the current Guppy president. We'll be waving our boas at the Sisters in Crime breakfast at Malice this year. There were no Guppies yes when I started writing, and SinC itself was in its fledgling first few years. There was, however, Shameless Promotion for Brazen Hussies! Who remembers that??? I wonder whatever happened to my copy... Those were great years. I'm a little sad I missed out on being a Guppy, but the friendships made through SinC have lasted more than two decades now. Krista, I LOVE your "Kinsey" story!!! I met Krista in my first critique group when I joined Guppies in 2002. She and Leslie are among my lifelong Guppy friends. One of the best things we ever did was realizing we didn't have to quit Guppies when we got published. (Before that, it was like flying up from the Brownies to the Girl Scouts.) In fact, that's one big reason unpublished newcomers learn both craft and business skills a lot faster than I did. Another level of experience was formed when already published writers like Roberta/Lucy started joining us. I feel incredibly lucky to have had the Guppies to swim with. We've gone through a lot of rocks and rapids and sudden falls together! Anyone who was raised with the image of a starving writer huddled in a drafty attic writing alone, will be shocked to find the Guppies. But writers above all people need a support network and cheering section, and that's what Guppies provide. I recommend joining the Guppies to anyone who says they've just started writing. You can learn skills in a number of places, but you can't always find friends and colleagues easily. What a wonderful article. Guppies and Sisters in Crime have been invaluable to me. So glad you all persisted. By the way...the other interesting thing to me is how many published authors stay on with the Guppies. Such a great group! And for those of you trying to find an agent, the agent quest group subgroup is a wonderful support. I have heard so much about the Guppies and wish I had known of them when I was working on my first novel ... 14 years in the writing before my agent sold it! Some days I need a word of encouragement, and today is one of those days. I am so glad you included Sue Grafton's advice: hone your craft. It's easy to forget when we're bogged down in all of the other aspects of being a writer. But craft is essential, and I am now going to take a few hours to myself simply to read some of the writers I admire and also the advice I have stored away in notebooks over the years. Is it alright if say thank you to the Guppies all over again? And again? I have learned so much! The online classes are always just what I need, and I have found them so much fun—this is the truth—I had forgotten they were classes. The Guppies classes I took felt more like a group of friends e-mailing what they know, giving each other assignments and feedback. They were much more than that, but they were so enjoyable I always wanted them to keep on going. I can't say enough for them. I hope I can give back like that. That's a great story, Krista. I've been a member of the Guppies for a few years, but only recently turned the email flood (and it can be a flood) back on - when I desperately needed a critique group for the new novel. I'm glad to say I got one, and am very excited to see some of the upcoming class offerings (including a plotting workshop with Linday Rodriguez). I am most disappointed that I had to bow out of the one starting Sunday, but my schedule just exploded and I was afraid of being overcommitted (I cannot take a class and not do it 100%). Joining the Guppies was one of the best things I've ever done. I met my best friend, discovered invaluable critique partners, came to know authors who have made a difference in my career, and found a bunch of people who wear virtual boas and toast others' success. And I know what font to use, too! Ah, the Guppies! :) I've learned so much and made so many good friends over the years. Various conferences have allowed me to meet Guppies I've only known via the loop for ::gulp:: let's just say "a long time." Except, when we finally meet face2face, it's like we're old friends picking up where we left off. Guppies is both a resource and a haven where we can find someone who "understands" in this mad-but-sometimes-lonely-tea-party writing can be. If you want to write mystery novels but have not yet been published, which membership do you sign up for? Anonymous, it sounds to me like you fit the professional category. Your interest is probably a little bit different than that of a fan or a reader. Krista, thank you! I was not sure if I fit in the Professional category since I have not published a novel YET. I understand your confusion. The form doesn't distinguish between published writers and unpublished writers. It's not as clear as it might be. I could be completely wrong, but I think your interest is professional. You would be interested in information about the business side of writing, like classes on setting. Readers and fans probably wouldn't care about that. I LOVE this story -- I'm so proud to be a Guppy! Published Guppy ones, thank you for stayin' in The Pond & providing published-expertise & professional mentoring to those of us who are unpubbed in the genre, but are tap, tap, tapping away to hone our mystery writing craft for the entertainment of readers, whether they are our critique partners or, it is hoped, the wider world. Brava!